The prodigy puzzle -- what happens to child prodigies? I brought my son's eyesight from 20/400 (legally blind) to 20/20 in only four months by using games where the eye has to track something moving. Here is how I did it. I wrote this so that other parents can treat their child's amblyopia. Summary: The key might be to do a sport where your eye (while patching) has to track something, moving toward and away from you, that you are trying to hit with your hand. This can be homemade bowling. This can be hitting a large balloon back and forth. This can be ping-pong. A lot of the research has been focused on computer games, rather than something that moves closer and away from you in real, physical space. The distance covered should be fairly large, say more than six feet. This should be more helpful than doing Legos, which my pediatric eye doctor recommended. At the age of six and 5 months, my child was diagnosed as having amblyopia and legally blind without glasses in his right eye. Amblyopia is often called "lazy eye." This is a common condition that affects about 2% of the U.S. population. What happens is that the 2 eyes are different in terms of near-sightedness or farsightedness. Although each eye could work fine if the other eye is closed, the 2 eyes cannot work together. If one is in focus, the othis one would be blurry. The brain deals with this problem in a child by gradually turning off one eye. Until recently, the medical profession generally said that the problem needs to be caught by age 7 for effective treatment, and that by age 10, it was too late to try to recover the eyesight in the blind eye. Treatment involves glasses and patching. Glasses are used to make the 2 eyes equal in terms of perception. Traditionally, the treatment is to cover the good eye (with an eyepatch, like those for pirates) to force the use of the weak eye. The treatment can range from 2 hours a day or less, to fulltime patching, depending on age and severity. It is generally said that the earlier treatment starts the better, as long as the child is old enough to keep glasses on and to tolerate the treatment. This condition of 2 very different eyes is generally present at birth. Consequently, it is good to start glasses at the age of 4 or 5 when a child is old enough to keep glasses on. Since my child was getting close to 7, I was pretty nervous. I didn't know how much the vision could be recovered, and how long it would take. The eye doctor was optimistic, and said he thought my son could be 20/35 within a few months. The eye doctor I saw was a pediatric specialist, and he seemed very knowledgeable. She also said some recent research seems to show that games that involve hand-eye coordination, such as computer games, are good for treating amblyopia. She prescribed glasses for my son. Even with glasses, my son could only achieve 20/80. This is not good because 20/80 is not good enough to drive. It is true that you can drive if your other eye is good enough (at least in some states). However, if your other eye became injured and lost its vision, you would lose the right to drive if you are 20/80. Feeling afraid and optimistic, I went to our medical school's library and paid for an account. I looked at every book they had on amblyopia, and lugged several pounds home. I read them very carefully. I also surfed the web. I found an interesting article about some British doctors who had treated amblyopia with only what sounded like only a few hours of a computer virtual reality game. In general, treatment with patching is expected to take months to recover eyesight, not a few hours. Note that Dr. Eastgate said the treatment worked IN ONLY ONE HOUR. One of the books from the medical school recommended ordering an eyechart and testing your child's vision weekly. That seemed like an excellent idea for me. The doctor had scheduled for child's follow-up for 2 months later. I did not like the possibility that I would go back in 2 months and be told he was not progressing, and we needed to increase the patching time. It felt like time was slipping away, since I only had a few months before he turned 7, and 7 used to be mentioned as a threshhold beyond which the chance for recovery drops off. Another book I read said to order 2 charts, one for distance, and one for near. The 2 I ordered are linked below. This eyechart is $19 and you only need to stand 10 feet away. Regular eyecharts require you to stand 20 feet away, and you probably don't have a room that long. I also got the pocket eyechart, which is to test your eyesight close-up (like when you reading). 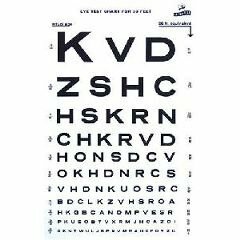 Pocket Size Plastic Eye Chart: 6 3/8" x 3 and one half"
We started a regime of patching 2 hours a day, while playing computer games. I picked computer games that involve something moving quickly on the screen (as opposed to a word puzzle, for example) and hand-eye coordination. I scheduled an appointment with an different eye doctor 5 weeks after the diagnosis. At this appointment, my son was 20/400 without glasses in his weak eye, but he was 20/25 with glasses in his weak eye! This eye had been 20/80 with glasses in the eye doctor's office. I was thrilled. It meant his left eye is nearly perfect (20/20) with glasses. However, I was concerned about the 20/400 in his left eye without glasses. I went home from the eye doctor's office and I thought it made sense, in that my son always wore glasses when he wore his patch. I decided to put his through a bunch of games where his eye had to track something moving, while he wore a patch but no glasses. I bought a toy bowling kit. I also made my bowling kit by piling up empty yogurt containers. I wrote numbers (using painting tape) on the containers so that my child would try to focus on reading something that was not very easy to read at a distance. (A higher number means a higher score for knocking that thing down.) I had him stand 10 to 15 to 20 feet away, and play bowling. We also played baseball indoors with a foam ball. I bought a toy laser tag game and we played laser tag. We also played indoor volleyball by using a balloon (no net). After a weekend of playing, I tested his again. Now he was 20/50 without glasses in his left eye! This is 3 days after he tested out at 20/400 (legally blind). I was overjoyed. And I truly I believed it was a verification of my hypothesis -- that you need to play games where the eye has to track something going farther away, and coming closer. I should tell you that my eye doctor did not recommend patching without glasses. She said it wouldn't hurt. I decided to do it on my own initiative, but this is not approved medical practice. Over the next 2 months, my son went to 20/25 with and without glasses. I tested his vision weekly, keeping track of time of day, activities engaged in, and what order I did the test in. (By order, I mean, for example, "left eye, with glasses, near vision chart," followed by "left eye, with glasses, distance vision chart.") Before each eye doctor visit, I would test my child's eyes to make sure I get the same results as the eye doctor (and thus showing that I am testing correctly). At his exam 4 months after the initial diagnosis, he was 20/20 in his left eye with glasses! Good luck to you. I hope this information will help your child get perfect vision.